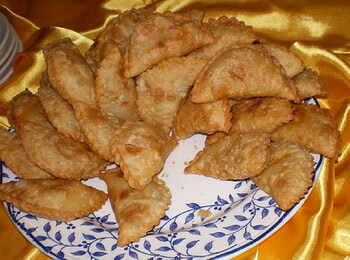 One of the more familiar types of Malay kuih, these epok-epok (or usually known as curry puffs). The curry puff, Malay fried fritters filled with a paste of beef, potatoes in a curry base��The crust was crispy on the outside. When broken into half, you can literally see the steam rising up from the delicious potato filling, beckoning you to take a bite. 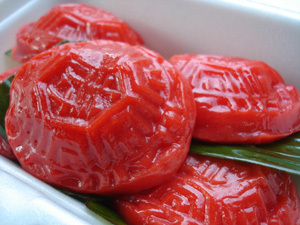 Ang Ku Kuehs is literally translated from Hokkien as Red Tortoise Cake. The sticky glutinous rice flour made as a skin to wrap up the silky peanuty flavour inside goes very well with its fillings. Usually found in local hawker stalls, there are a variety of ang ku kuehs sold ranging from sweet peanut fillings, salty peanut fillings, chicken mushroom fillings and also ranging in various sizes from tiny to palm size. The usual colours of ang ku kuehs sold are bright red or dark green. 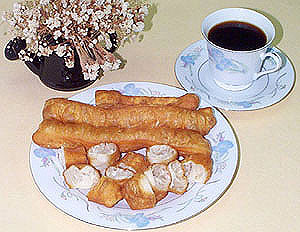 Yu Tiao, also known as Yew Char Kuih or Cakoi is normally made from wheat flour or self raising flour added with sugar, salt and yeast. The dough which is fried in oil, is so crispy on the outside and fluffy on the inside. Eat it while its fresh and hot from the wok. Goes well with a cup of steaming hot tea..